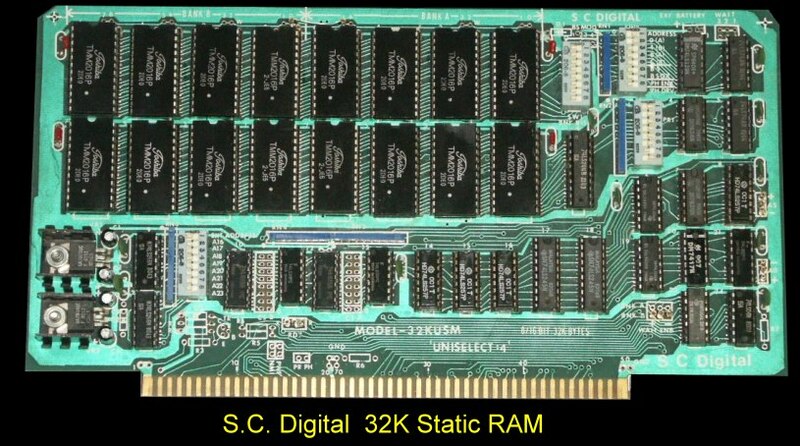 S.C Digital came out with this board around January 1979. It was their first S-100 board. The board utilized the TMM 2016P Fully Static 4Kx8 memory chips for reliability and DMA capability. The board had 16 or 24 bit addressing and an 8 or 16 bit wide data path. It could also utilize the (common at the time) Cromemco bank select feature for a 32K memory block. EPROM's could be inserted in sockets in place or RAM chips. Access time was fast, 250 nsec. for 4MHz Z80's or 8MHz 8086's without a wait state. There even was provision for battery backup. I do not have a manual for this board. (With all those switches looks like it will be needed). If you have one please let me know.